The ‘Godfather’ of the Arts and Crafts movement, William Morris, is famed for his quintessentially British prints depicting hedgerow flowers, brambles, thrushes, strawberries, and daisies, but diaries from his Icelandic expeditions of the1870s reveal that he felt equally at home in the dramatic mountainous landscape of the north. Throughout, the pages offer accurate and evocative descriptions of the Icelandic scenery, from the distant snow-capped mountains and cobalt skies, to the delicate, dancing yellow horn poppies, and capture a spirit of childlike discovery. Spurred by his zest for adventure, the Morris & Co design team took inspiration from the diaries and set out on their own journey to create a new collection that pays homage to Morris' breathtaking experiences. 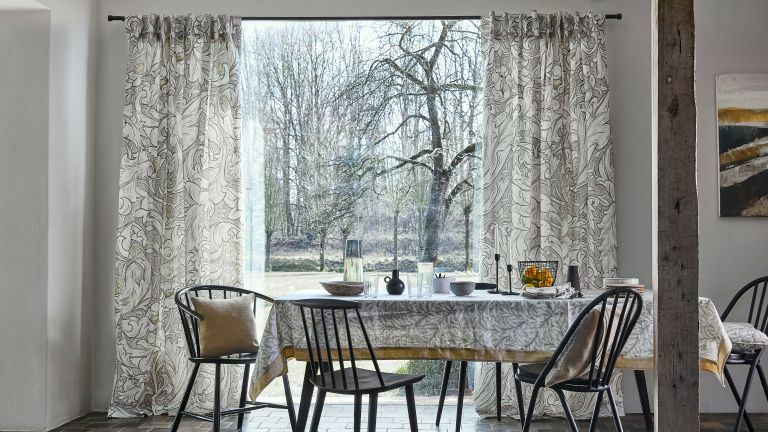 A range of complementary fabrics, embroideries, wallpapers, cushions and ceramics, the resulting North Kindred collection sees favourite Morris designs such as Thistle, Bachelor's Button and Willow, carefully refreshed in colours and textures inspired by the Icelandic landscape. A neutral Pure Morris palette of White Clover, Stormy Grey, Flax and Linen is used throughout, lifted with hints of Horned Poppy, Faded Sea Pink and the dramatic Black Ink, while chunky weaves and delicate embroideries are teamed with metallic mica highlights which nod to the icy scenes.